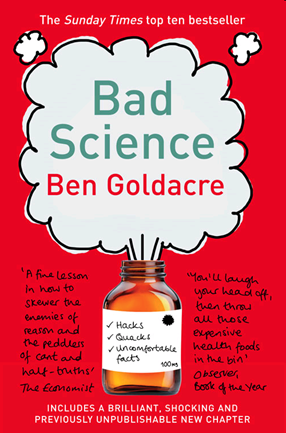 Just so that your visual search strategy is correctly callibrated for bookshops and friends’ living rooms, here is the cover of the new and cheaper edition of Bad Science. It features both an index and a new chapter, which I will post for free on the web in a minute. More below. If you’re wondering why there is a new paperback, the previous was a “trade paperback”, and this is a normal one. Basically I didn’t want to have a hardback as I think they’re stupid fetish items when books should be cheap, convenient devices for transporting words around, but the best I could do was trade paperback first, and I’m pleased to see that this new edition is already turning up for as little as £3.50 on Amazon marketplace. It’s worth bearing in mind that this isn’t a new edition, and I’ve not run through and updated or changed things, but it does have a new chapter, on Matthias Rath, which I will post in a minute, and which we’re releasing (after a bit of chat) under a creative commons license, so you’re free to post it on your blog or wherever you like. There is also an index, and although the pagination is a bit different I’m thinking around ways to make one for the old edition and bung that online too. Time Out, Spiked, Times Higher Education, Student BMJ, International Journal of Epidemiology, British Medical Journal, British Journal of General Practice. If you’ve reviewed it on your blog, let me know and I’ll try to update the post with a list of those too. Fantastic. I’d all but bought everyone I know a copy of your ‘trade’ version, but did lament the absence of an index. People can now have the snazzy red number for their next birthdays! In the same way that Greg Mortenson’s ‘Three Cups of Tea’ is now required reading in the Pentagon and officer-circles of the US military, ‘Bad Science’ should be required reading in governmental science committees, journalism schools and across the board in big pharma. I noticed an advertisement in today’s Metro in London. I liked the advert very much – I found it eye-catching and memorable (but I may be biased here). I’m looking forward to reading the ‘previously unpublishable’ chapter. Good work. As per usual, the review in the sBMJ is copied from its grown-up counterpart. I’m half way through the original version and squirming with delight as I turn each page. More power to you, sir! That new chapter is gonna eat at me forever. You asked for blog reviews – here was mine. The book remains one of my top 5 ever … irritatingly though I’ve lent it to someone who has yet to give it back! Now for the missing chapter. Could you point out to your publishers that it is pure insanity to have the paperback on sale at Waterstones for £6.29 but the ebook version, on the same website, is “£10.36 – List price: £12.95 – You save: £2.59”. Well now that the cheaper version is available, I think I’ll get a couple of copies to lend out to friends. I think this is the first book I’ve ever considered doing that with. Nice, I shall get it. Incidentally, I’d be interested to hear your thoughts on the mild criticsm expressed in the TLS review (especially as your caricatural view of journos doesn’t really chime with your understanding of the role of psychological and sociological problems in dealing with issues of public health). Has there been any word from Private Eye? eBook prices are crazy – they should be a fraction of the paper equivalent but the publishing industry is so terrified that they don’t seize the opportunity. Not to mention the fact that an ebook from Waterstones will be loaded with Adobe DRM so won’t work on plenty of readers – you couldn’t read it on your iPhone for instance. Sorry – rant over (it just makes me very cross – I want to adopt ebooks and pay for them but the publishing industry just doesn’t want me to). Have been wanting to send out copy to ex-pharma friend in medical publishing but was waiting to see what was updated in new edition, will now specify the new edition. Re. the comment from Steve Page, Herr Dr Matthias’ surreal (but entirely in character) response has simply been to claim that he won. I posted a comment about this on the other thread, or you can read about it on my blog in the post from a few months back on “Keeping it unreal“. Cheers, Dr Aust. 🙂 I missed that at the time. His ability to deny reality is truly remarkable. You’ve still got the old “Load of Rubbish” cover at top left up there – worth changing that when you have a mo. BTW. Recently read the Rath chapter. I hope you do a whole book on him sometime soon. I agree with the eBook comments; publishers really, really seem to want this format to fail. Not only is the electronic version more expensive than the hard copy, but it is much less asy to get a hold of. I can’t believe that you can buy the reader from Waterstones, but that there is then no facility instore to dump the books onto it. Several times recently I’ve been browsing in a shop, seen a book that I want, and then ended up buying the paperback, as the staff were unable to even tell me whether it existed in e-format, let alone put it onto the reader. I’d buy an electronic copy even though I already have a paperback version, but not at over £10. I’ve written a review, in Dutch, on my booklog. Bad Science deserved the label ‘aanbevolen'(recommended) easily [an honour it now shares with Gerd Gigerenzer’s Reckoning With Risk, coincidently]. Reviews in Dutch, in Spanish… any translations on the way? I may have to buy this after all: I got two trade paperbacks for christmas, lent one out and gave the other one away just a week ago. Turns out the one I loaned to a mate has gone missing. …we suspect my mate’s stepdad (a scientist by trade no less) has pinched it. Bought it. Read it. Liked it a lot. Being in the USofA I’d like to know how I can get my hands on the new cheap paperback! Amazon USA doesn’t even have the first release stocked….any UK book sites with free/cheap shipping to the US? I should probably get 10 so I can pass it around!